Simply stated, Task Management is a method to keep track of work that needs to be done. And whether you’re collaborating with a team or just working on your own projects all by yourself, it’s important to manage your productivity. But keeping track of everything can be both time consuming and a real headache, especially for a business owner or manager who needs to coordinate with a staff, large or small. Not only that, too often a business is at risk of losing great clients because something got lost in the shuffle. Sometimes, someone didn’t follow up in a timely manner, other times certain details were overlooked. Whatever the exact difficulties your business faces, wouldn’t it be a great help if all of the work could be kept track of? And accounted for? With complete transparency? With our online task management system, you can organize your own tasks, collaborate in real time with your team and access your workflow across multiple computers or even mobile devices. You can create tasks, assign particular people to the job and keep those not involved out of the loop. Task101 lets you assign due dates and even organize your tasks into projects. We even include a real time comment system that eliminates those tedious back and forth emails. And with our forum it’s like having your own collaborative social network. 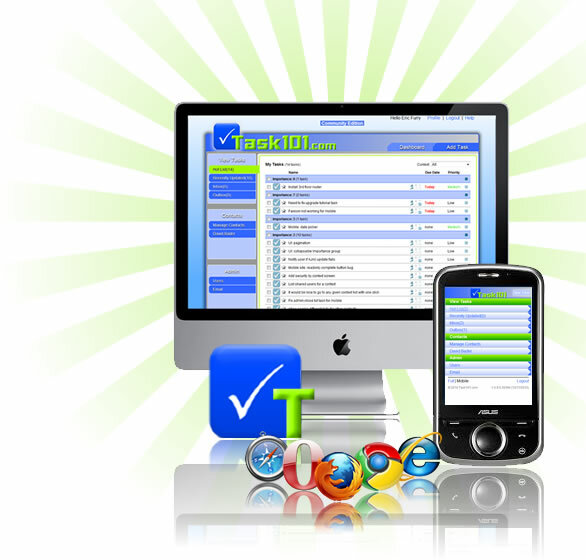 Our advanced, online task management software provides instant notification, letting you know before anything can become a problem, a full history and audit trail, so you know exactly what happened and when, complete privacy and security, so only your selected groups or individuals can observe the task, and we made sure that it works with all of the major browsers and even mobile devices. And to make it even better, you can set everything up with a few simple clicks and review everything with our at-a-glance progress report. We’ll even let you try it for free!